"The Final Countdown" Is Completed! Vintage Kenner Wrap-Up Next! We’re done! It’s hard to believe, but our “The Final Countdown” marathon of the Star Wars Series 8 Vintage Kenner Mini Action Figures has concluded. If you need to catch up on any of them, all you need to do is click any thumbnail below, and it will take you to the archive. We’d once again like to thank you for your participation. Be sure to come back in a couple of days for the complete vintage Kenner recap, a thank you, and an important announcement. ← New Diorama Pieces From Hole in the Ground Pro - Available Now! DON’T FORGET TO CLICK THE COIN! We have ONE WEEK left of vintage Kenner figures! Let’s move right along with our uninterrupted run of the final wave of vintage Kenner figures which we’re calling “The Final Countdown.” These 15 action figures make up Kenner’s THE POWER OF THE FORCE series 8 figures. The Luke Skywalker (Imperial Stormtrooper Outfit) figure is next in our Research Droids Reviews today. Be sure to add your own experiences to the conversation! Reminisce your own childhood stories of this figure in our comments. Share your life-changing vintage Kenner adolescent experiences with us! DON’T FORGET TO CLICK THE COIN! We continue with our uninterrupted run of the final wave of vintage Kenner figures which we’re calling “The Final Countdown.” These 15 action figures make up Kenner’s THE POWER OF THE FORCE series 8 figures. Here’s another beauty of a figure that still looks great today! But there is still debate on the Imperial Gunner. Find out why in our Research Droids Reviews today. Be sure to add your own experiences to the conversation! Reminisce your own childhood stories of this figure in our comments. Share your life-changing vintage Kenner adolescent experiences with us! Now let’s check out the TIE Fighter And Pilot Set from the Star Wars Toybox line. It’s a whole lot of fun, but will you care? Learn more in our Research Droids Reviews today! Be sure to leave your thoughts in our comments section, vote in the poll or even comment about it on our Facebook page. Click the banner below for the direct link to the review! As always, you can also send your review requests via email if you’d like to see something that we didn’t cover yet. ← TBS [P3] Stormtrooper Helmet For $49.99! TBS6 [P3] Red Squadron Astromech 3-Pack On Sale! 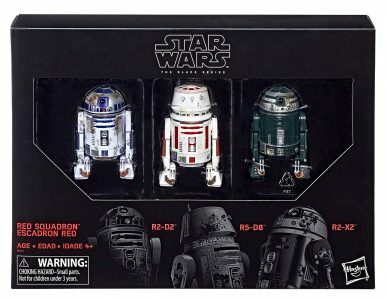 The Black Series [Phase III] Red Squadron Astromech Droid 3-pack in on sale for $41.99 with one-day FREE shipping! NEW COMPARISON PHOTOS ADDED! The Star Wars [Solo] TIE Fighter Force Link 2.0 vehicle is SO GOOD we feel like we’re missing something. It’s one of the freshest vehicles Hasbro produced in over a decade. Find out why you’ll definitely want one in our Research Droids Reviews today! Be sure to leave your thoughts in our comments section, vote in the poll or even comment about it on our Facebook page. Click the banner below for the direct link to the review! As always, you can also send your review requests via email if you’d like to see something that we didn’t cover yet.